While Huang was quick to point out the chip's fantastic graphical capabilities (without going into extreme detail), he also wanted to show off its video rendering prowess. The Tegra X1 is rated to handle 4K video at 60 hertz, using both the H.265 and VP9 standards. 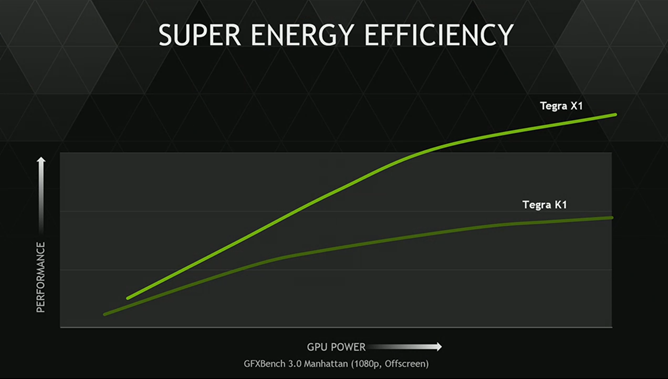 He also wanted to highlight the chip's efficiency, showing a slide that says the X1 uses about 40% less power than the Tegra K1 (which powers the company's current flagship SHIELD tablet) under the same load. 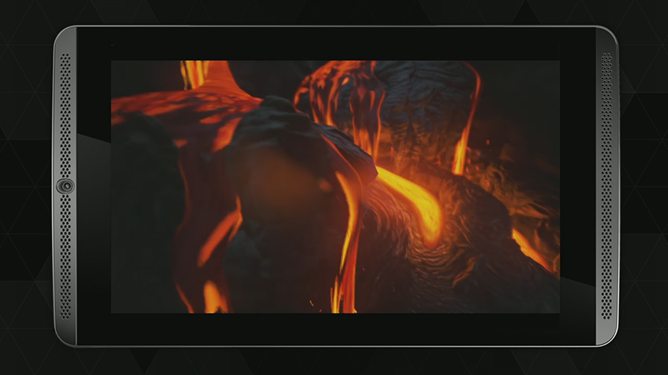 The single tech demo for the mobile Tegra X1 was "Elemental" from Epic. 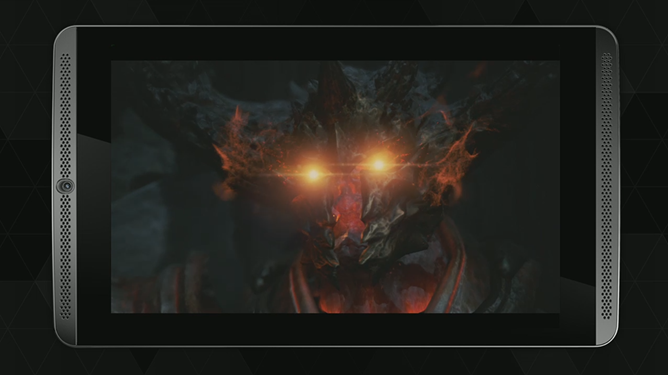 To be perfectly honest, it wasn't all that impressive - while the crumbling temple and fire demon were complex, the live rendered demo showed some clear choppiness and loss of frames. NVIDIA showed performance increases of roughly 40-100% over the K1, and considerable improvements over Apple's proprietary A8x architecture as well. The company claims that the Tegra X1 is the world's first mobile processor to reach teraflop performance, at a tiny fraction of the power required to do so on an Intel Core i7 processor. 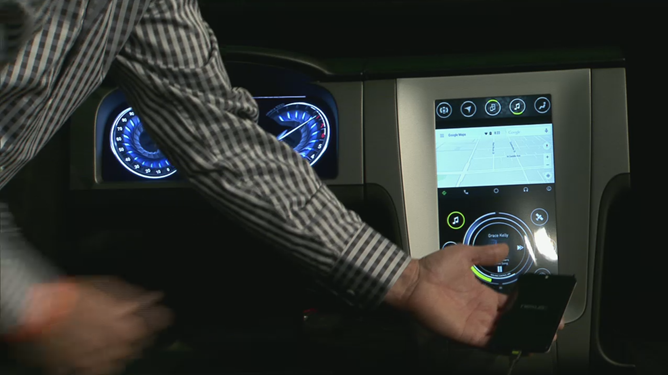 Unfortunately, Huang went immediately to a demonstration of the X1 running a proprietary dashboard and infotainment system for a dummy car (though it was running Android Auto). While NVIDIA will certainly use the Tegra X1 in an upcoming Android device and license it for other electronics vendors, there's nothing to report on that front at this time. 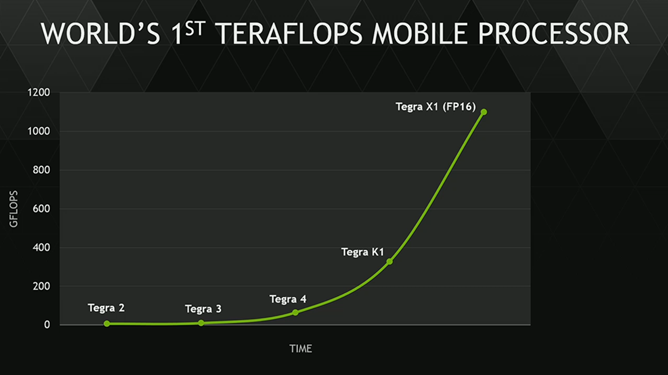 Expect Tegra X1 hardware, including some SHIELD iteration, later this year. NVIDIA's previous two generations of chips have debuted in the summer in the northern hemisphere. Update: Here's the video of NVIDIA's press conference. 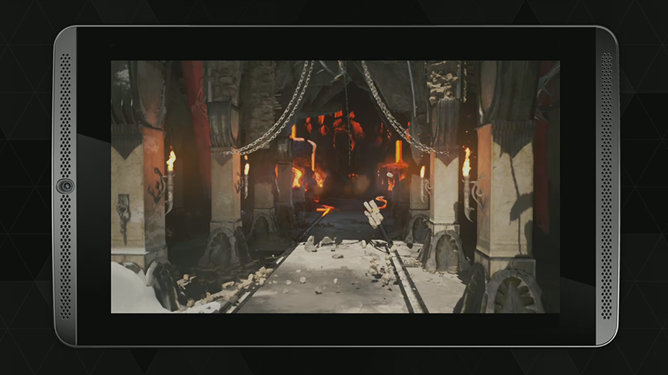 Skip to 6:40 to see the Unreal 4 tech demo. 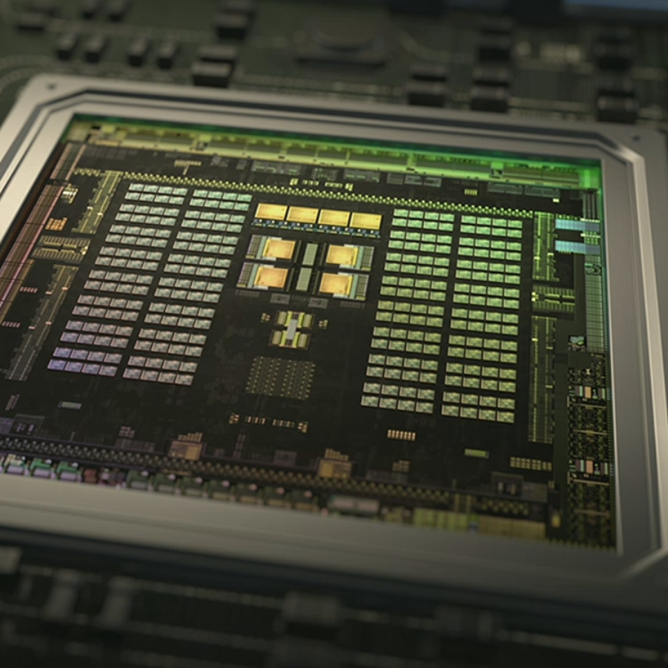 LAS VEGAS, NV--(Marketwired - Jan 4, 2015) - CES -- NVIDIA (NASDAQ: NVDA) today unveiled Tegra® X1, its next-generation mobile super chip with over one teraflops of processing power -- delivering capabilities that open the door to unprecedented graphics and sophisticated deep learning and computer vision applications. Tegra X1 is built on the same NVIDIA Maxwell™ GPU architecture rolled out only months ago for the world's top-performing gaming graphics card, the GeForce® GTX 980. The 256-core Tegra X1 provides twice the performance of its predecessor, the Tegra K1, which is based on the previous-generation Kepler™ architecture and debuted at last year's Consumer Electronics Show. It will be featured in the newly announced NVIDIA DRIVE™ car computers. DRIVE PX is an auto-pilot computing platform that can process video from up to 12 onboard cameras to run capabilities providing Surround-Vision, for a seamless 360-degree view around the car, and Auto-Valet, for true self-parking. DRIVE CX is a complete cockpit platform designed to power the advanced graphics required across the increasing number of screens used for digital clusters, infotainment, head-up displays, virtual mirrors and rear-seat entertainment. "We see a future of autonomous cars, robots and drones that see and learn, with seeming intelligence that is hard to imagine," said Jen-Hsun Huang, CEO and co-founder, NVIDIA. "They will make possible safer driving, more secure cities and great conveniences for all of us. 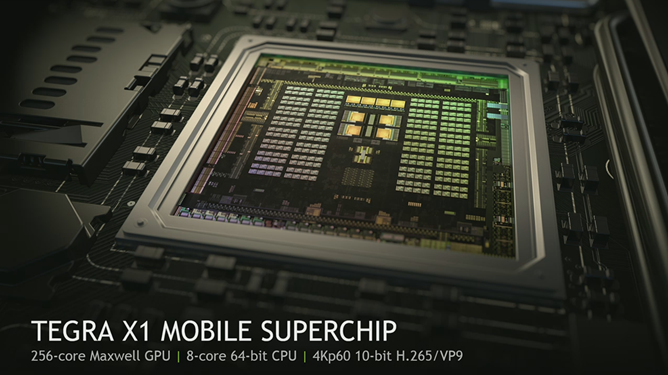 Driven by the exceptional graphics compute horsepower from Maxwell, NVIDIA's 10th-generation GPU architecture, Tegra X1 is the first mobile processor with capabilities that rival supercomputers and game consoles. Indeed, Tegra X1 has more horsepower than the fastest supercomputer of 15 years ago, ASCI Red, which was the world's first teraflops system. Operated for a decade by the U.S. Department of Energy's Sandia National Laboratory, ASCI Red occupied 1,600 square feet and consumed 500,000 watts of power -- with another 500,000 watts needed to cool the room it occupied. By comparison, Tegra X1 is the size of a thumbnail and draws under 10 watts of power. As serious gamers know from using the NVIDIA® GeForce® GTX 980 GPU, the Maxwell architecture solves some of the most complex lighting and graphics challenges in visual computing. Its innovations include Voxel Global Illumination, or VXGI, for real-time dynamic global illumination and Multi-Frame Anti-Aliasing, or MFAA, for incredibly lifelike graphics in the most demanding games and apps. 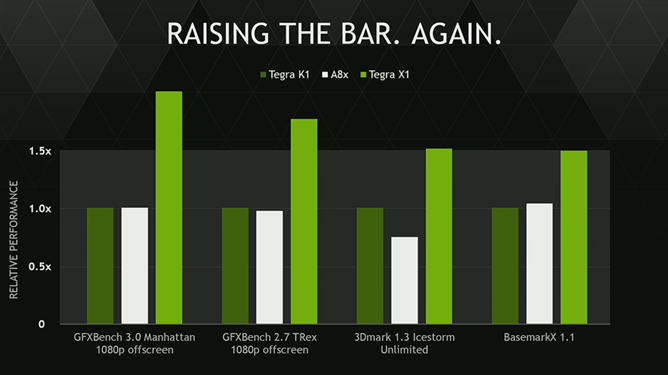 "Tegra K1 set a new bar for GPU compute performance, and now just a year later Tegra X1 delivers twice that," said Linley Gwennap, founder and principal analyst of the Linley Group. "This impressive technical achievement benefits both 3D graphics, particularly on devices with high-resolution screens, as well as GPGPU software that is becoming more prevalent, particularly in automotive applications." Tegra X1 supports all major graphics standards, including Unreal Engine 4, DirectX 12, OpenGL 4.5, CUDA®, OpenGL ES 3.1 and the Android Extension Pack, making it easier for developers to bring PC games to mobile.